ArtScience Museum and teamLab invite you to transcend boundaries with all new artworks in Singapore’s largest digital art exhibition, FUTURE WORLD: Where Art Meets Science from September 2018. In this major transformation, ArtScience Museum Future World introduces 10 new digital artworks taking the number of pieces in the exhibition from 15 to 19. 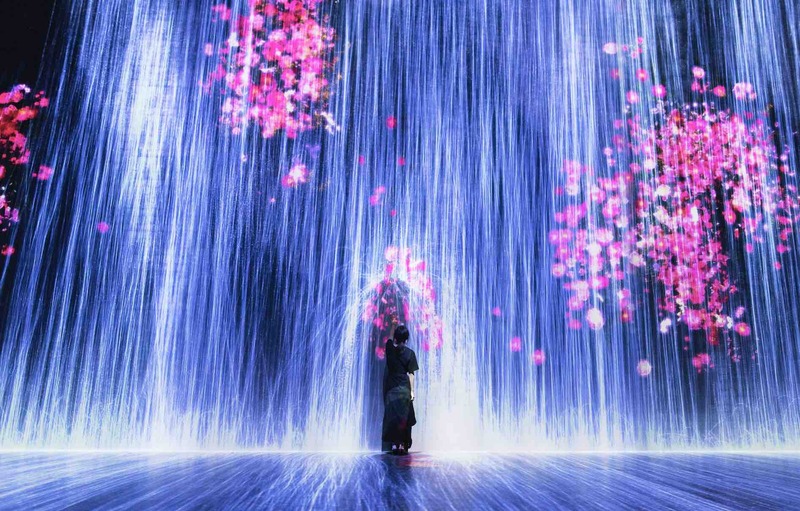 The dramatic starting point of the new-look show is the opening gallery, which features teamLab’s new concept, Transcending Boundaries. 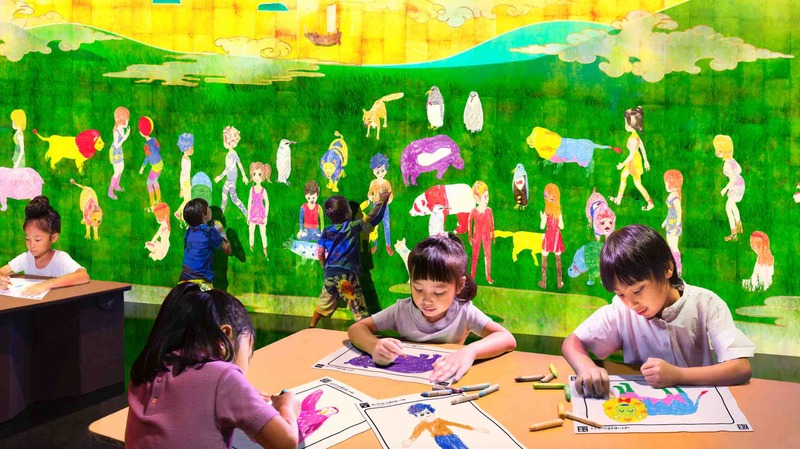 The Nature galleries of Future World was completely rebuilt to introduce the new concept to Singapore which now features interactive and immersive artworks by teamLab that use both art and science to transport you and your loved ones to a digitally-rendered natural world. Comprised of six artworks, Transcending Boundaries explores the relationship between people and nature, breaking down the boundaries between audiences and the artworks. The stunning centrepiece of the latest version of this ever-changing exhibition is an entirely new gallery. The fifth gallery of Future World, named Sanctuary, is intended to be an oasis of calm, in the centre of the show. Sanctuary invites you to take a moment for reflection and meditation before arriving at the busy joviality of the final part of the exhibition. To launch, Sanctuary, ArtScience Museum will unveil the South East Asian premiere of teamLab’s brand new artwork, Impermanent Life: People Create Space and Time, at the Confluence of their Spacetime New Space and Time is Born. “When ArtScience Museum conceived of Future World with teamLab, we set out to make something that was more than an exhibition in a traditional museum. We wanted to create a new world that would evolve and grow over time, that would respond to each and every visitor, and that would draw people to visit again and again. Earlier this year, we welcomed our millionth visitor to Future World, a clear sign that audiences want to take a journey through the digital worlds of the near future. This major rehang is the most radical change in Future World since we opened more than two and a half years ago. It is a vivid realisation of our vision for a permanent, yet changing exhibition, and will give visitors a renewed opportunity to experience the confluence of artistic expression, technological ingenuity, and scientific enquiry,” said Honor Harger, Executive Director of ArtScience Museum. Within Transcending Boundaries, elements from one artwork influence and engage elements from other artworks. The artworks respond to the presence of viewers and subtly change based on their behaviour. The individual artworks and their interplay with one another inspire a sense of rapt contemplation, as the installation evolves over time and with participation. When entering the space, you and your family will be greeted by a stunning six-meter high interactive waterfall that serenely cascades down the wall and onto the floor. The water particles are digitally programmed and generated to produce an accurate water fall simulation of water particles. The direction of the water changes with the lightest touch of the hand. Just like in nature, the waterfall promotes biodiversity creation. The Nature galleries in Future World invite you to understand that nature is something that includes, enfolds and embraces people and the things they make; there are no boundaries between human and nature. Town, the second section of the exhibition will see the addition of a new artwork, sharing the space with the artwork A Table Where Little People Live is. In this interactive artwork, you can be a music composer for a day. 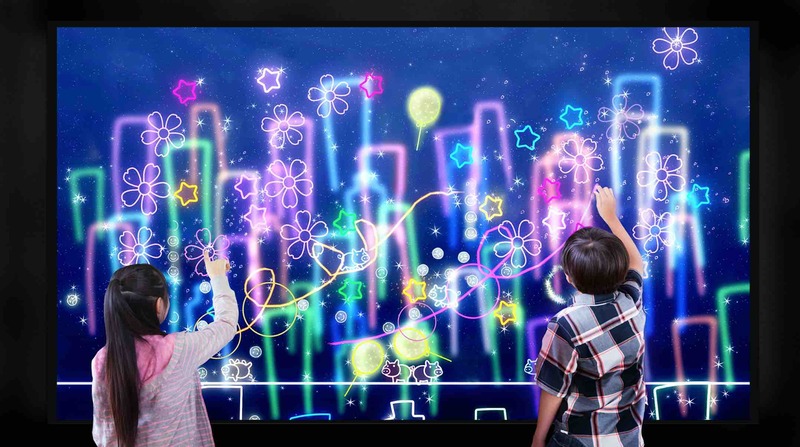 They can compose their own musical masterpiece by drawing lines of varying heights to determine the musical scale, and tap the wall to drop a ball onto the drawn lines to create a symphony of sounds. As more adults and children come together to inspire one another to create music in a shared space, it will create a more vibrant, animated and lively musical environment. The refreshed Future World will introduce you and your loved ones to a brand new gallery, Sanctuary. A destination in its own right, Sanctuary provides you with a quiet haven to contemplate and take a breather from the bustling Town before continuing their adventure to Park. Built to be a flexible and dynamic space, Sanctuary will showcase a rotating roster of seasonal artworks, giving repeat visitors with a different experience each time they return. Marking the launch of Sanctuary is the Southeast Asian debut of one of teamLab’s latest artwork, Impermanent Life: People Create Space and Time, at the Confluence of their Spacetime New Space and Time is Born. 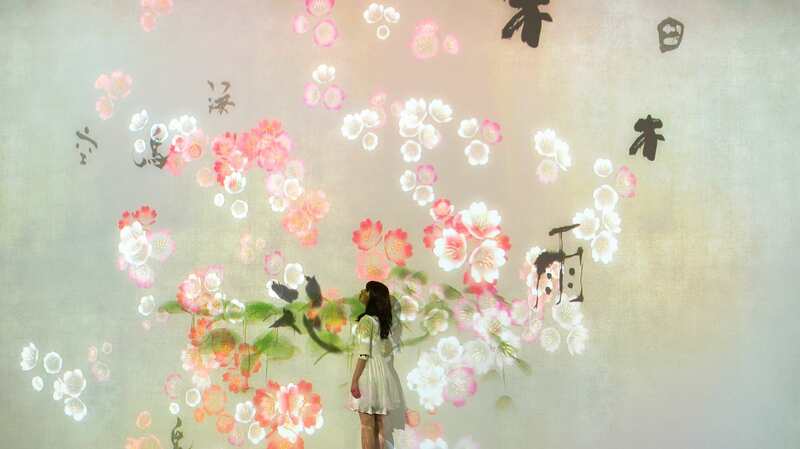 In this interactive artwork, cherry blossoms bloom and scatter, playing out the cycle of life and death. Responding to human interactions and the state of the environment, the radiating circles form around your feet will either luminate or darken the entire space. Park, the third chapter of the exhibition, encourage you and your loved ones to appreciate ‘play’ as an essential part of human life. Two new artworks are introduced to connect you by encouraging you to come together to co-create your shared experiences. 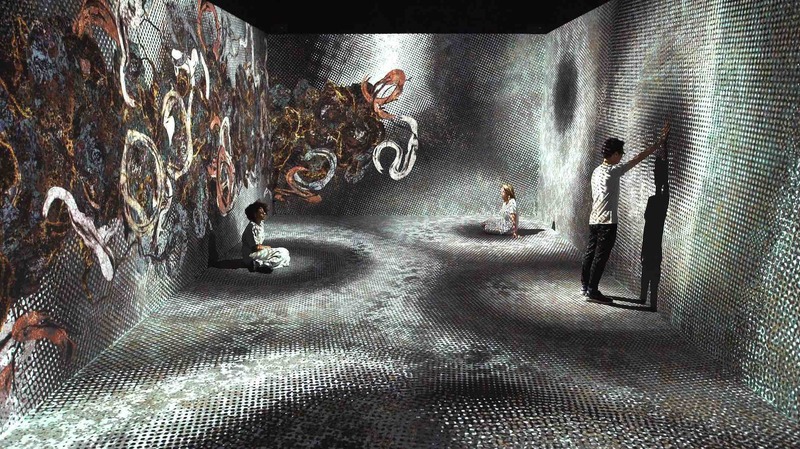 This installation features a virtual world of people and animals created by you. This dynamic artwork evolves with each visitors’ participation. It reflects an ever-changing ecosystem where virtual people and animals co-exist and live harmoniously with one another. You can interact with these people and have them respond back through a variety of actions. In Sketch People & Animals, an individual’s creative contribution becomes part of a unified, shared experience. What a Loving, and Beautiful World is a mesmerising digital projection of Chinese characters cascading from ceiling to floor. Activated by touch or viewer’s shadow, these characters will transform into nature motifs associated with the meanings of the characters. These motifs include wind, rain, trees and mountain. As you and your family continue to interact with the motifs, the artwork will transform to reflect an ever-changing landscape. The refreshed Future World is one of the three major exhibitions that will be presented at ArtScience Museum for the rest of 2018 and first quarter of 2019. In October, you can look forward to an exhibition that celebrates the centenary of a Nobel prize-winning physicist and his impactful contributions that shaped the world that we live in today. A third exhibition is also set to open in November. More details will be announced soon.